Make the shells: Add the almond flour and the powdered sugar to the bowl of a food processor and pulse it 10 to 12 times. You want to have it fine but not allow the oil in the almonds to seep out and turn it into a paste. Immediately sieve it on a large bowl and reserve. To a small bowl, add half of the egg whites (56 g), then add the food dyes and vanilla. Mix until it is all well incorporated, the dye sometimes resists mixing homogeneously into the egg white. Now comes the fun part. You will add the other half of the egg whites to the bowl of a mixer and the granulated sugar and water into a small saucepan. Have an instant thermometer ready. Start beating the egg white in slow-speed, as you turn the heat and start bringing the sugar syrup to a boil, without stirring (this is important, or you risk crystallizing the sugar and having to start all over). When the sugar starts boiling, increase the mixer to medium-speed. You want it to be at the stage of soft peaks by the time the syrup reaches 244 F. Once that happens, slowly drizzle the syrup into the egg white-sugar, as you continue beating. Beat until the temperature cools down to around 115F, no need to bring it down all the way to room temperature. You don’t want to have a very stiff meringue at this point, or it will be too hard to incorporate into the almond flour. The second fun part starts now, the famous macaronage. Add the dyed egg white and the meringue on top of the almond flour and mix gently but decisively. 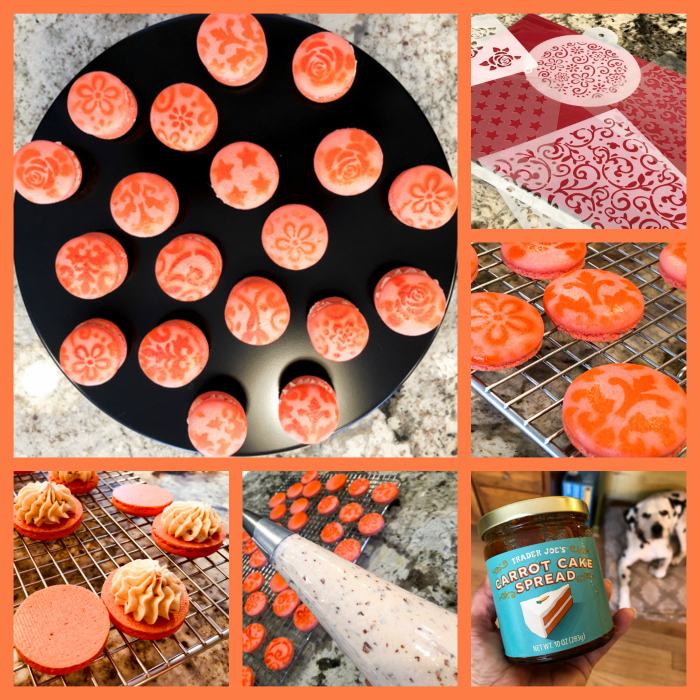 If you have never made macarons before, I advise you to watch some videos on youtube to familiarize yourself with the proper macaronage. You want the batter to flow from the spatula and form a figure eight on the surface as you allow it to drip, but it should not flow too rapidly. If you spoon some batter on parchment paper, it should smooth out in about 30 seconds or so. Once you get to the right stage, fill a piping bag fitted with the piping tip of your choice (I like a 1/2 inch opening), and pipe on parchment paper or Silpat. Bang the baking sheet a few times to release air bubbles, and allow it to dry at room temperature for 30 minutes or until the surface feels dry to the touch. Bake at 300F for 10 to 12 minutes. Cool before peeling off the baking sheet. Decorate either before filling them or after, depending on the type of decoration you choose. I used an air-brush and stencils (see my composite picture), with the color Sunset Orange from Chefmaster. Make the filling. Place the egg whites and the sugar in a large metal mixing bowl set above a pot of simmering water. Whisk the mixture until the sugar melts and the mixture becomes warm and very thin in consistency, reaching a temperature of around 160F. Transfer the contents to a Kitchen Aid bowl and whisk on high-speed until stiff peaks form. Now, change the whisk to the paddle beater, add the butter and salt, mixing on low-speed. Add the butter piece by piece and keep mixing. When the butter seems to be all incorporated, even if it looks a little curdled, increase the speed to high. The mixture will become smooth and totally creamy within a few minutes. Add the carrot cake spread and mix on low-speed. Taste and add more if you feel like it. 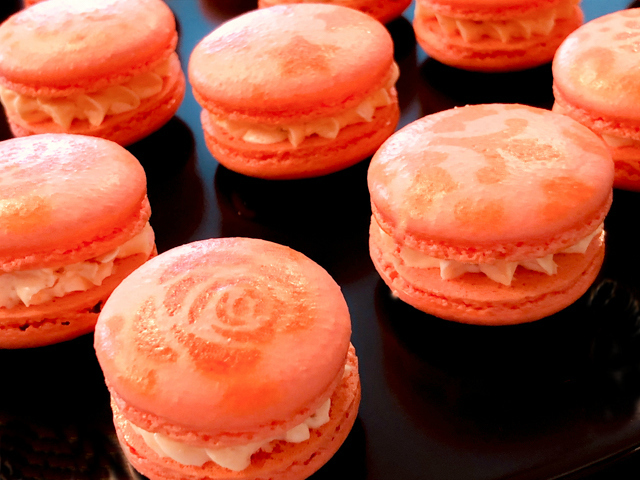 Put the mixture in a piping bag fitted with an open star piping tip and fill your macarons. Place them in the fridge overnight and bring to room temperature 15 minutes before serving. Comments: If you’ve been following my blog for a while, you know I have a lot of macaron recipes. They always involve the French meringue method because it is so simple and it has always worked for me. I had issues with the Italian meringue and several batches were a failure, but I know that many bakers find them better in terms of texture and reproducibility. Basically because the Italian meringue is much more stable and is less affected by humidity in the environment. My main goal in macaron baking is maximize the proportion of feet, because I like them with bigger feet and a plump shell, so I like to try different methods and compare how they work for me. The Swiss meringue method should happen eventually, although for the time being I intend to play with the current recipe a few more times. I am happy that this batch worked perfectly. The main thing I changed was adding the food dye to one half of the egg white component, and add that to the almond flour together with the Italian meringue. In the past, I followed recipes that instructed you to add the egg white to the almond flour first, forming a thick paste and allowing that to sit while the meringue is prepared. 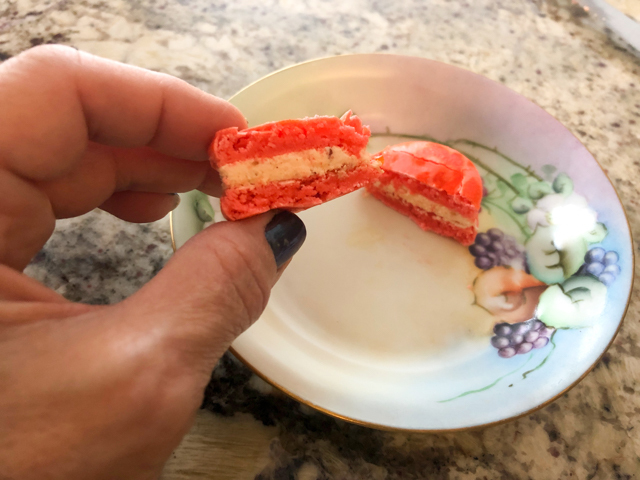 I found that this approach makes it pretty tough to incorporate the meringue and probably negatively affected the macaronage step that follows. SIX YEARS AGO: Spring has Sprung! You’ve had so many successes that a fail or two is just a blip. I’ve only tried making them twice. About 3-4 yrs apart. So I didn’t really have a chance to learn from my previous mistakes as each time was like making it for the FIRST time. These sound delicious! I’m going to have to scout out TJs for this ingredient! P.S. I am so amazed at Trader Joe’s cult following. I’m old enough to have shopped at the first store when they were just a small chain here! We don’t have TJ in town, but we have Aldi, which apparently was started by the other brother… a store with more or less the same approach. When we have a chance to stop at TJ we do, but that happens rarely, maybe once per year or so. Beautiful macarons! I’ve had my eye on that carrot cake spread but have managed to resist the temptation so far. I love all of their cookie butters and spreads!